Park City School District Interim Superintendent David Gomez has announced the addition of four new secondary assistant principals for the 2018-19 school year. 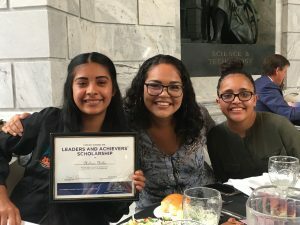 By adding an additional assistant principal at each secondary school, Superintendent Gomez said it will bring the ratio of administrators to students more in line with the Utah ratio. Principals have also said they need additional administrators in their buildings to help with licensed evaluations, assist with UHSAA and club sports, school clubs, student supervision, safety, student wellness, discipline, evening and weekend activities, increase in 504s, and parent communication. Weekes has been teaching for the past 15 years at middle school, high school, and summer school levels. She has worked as a math interventionist for eight years in both middle school and high school. Weekes has taught at Park City High for six years. 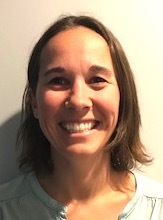 Tschabrun started her career in education 14 years ago in Vermont where she was a math teacher, alpine ski coach, and soccer coach. She has taught middle school math at a charter school, and taught high school math and served as the department chair at a private school in Salt Lake City. She came to PCSD two years ago as a math teacher at TMJH. She spent half her time this past school year as an instructional coach at the school. Originally from Westchester County, New York, Mahon-Reynolds is starting her 19th year in education. 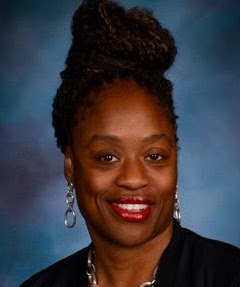 Her educational experience includes teaching (K-12), coaching (K-6), middle school administrator, higher education instructor, and staff developer. She is currently completing her doctoral studies at the University of Utah in the Educational Leadership and Policy Department. She has lived in Utah for 13 years. 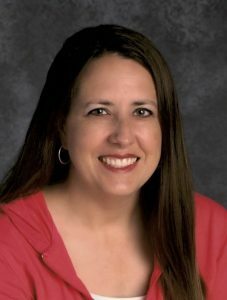 Fike has been the Instructional Technology Coach at Parley’s since 2016 and has been an administrative intern at Parley’s Park, Ecker Hill Middle, and Park City High. From 2013-16 she was a reading intervention teacher at Ecker Hill Middle. The board approved the FY18 Revised Budget and the FY19 Preliminary Budget by a vote of 4-1. Board member Petra Butler dissented. The board unanimously approved the preliminary property tax rates. Derrick Radke, Public Works Director for Summit County, reviewed the Park-and-Ride lot under construction on Kilby Road. The board granted easements for a tunnel that will connect the school to the Park-and-Ride. The county assured the board it will install high-resolution cameras in the lot for heightened security and will provide a camera feed from the tunnel to the school. Radke said the Summit County Sheriff’s Office has agreed to patrol the area on a regular basis and will assist with increased traffic the first few days of the school year. Board member Petra Butler asked if the county was concerned about the additional traffic on Kilby Road. Radke said road improvements will help with the anticipated capacity. He said many Park-and-Ride users will not increase traffic during school hours. Radke anticipates the tunnel will complete before the 2018-19 school year starts. The Board selected Option 1A for Park City’s proposed pedestrian and bike tunnel planned under SR 248. The proposed tunnel is in front of Park City High and LDS Seminary. It will replace the existing signalized crosswalk. The tunnel will provide for a higher level of safety and connectivity for students as well as the community at-large, and will improve the overall delay and vehicle congestion on Kearns Boulevard. Mellissa Mellin, a 2018 Park City High graduate, was awarded a $10,000 scholarship at the Comcast Leaders and Achievers Scholarship Luncheon held at the Capitol Rotunda today, June 20. Mellin was one of 34 students recognized for her academic achievements, demonstrated leadership, and commitment to community service. She has been accepted to Westminster College where she plans t0 study political science. Scholarships were awarded by the Comcast Foundation and ranged from $1,000 to $10,000. Mellin was the only student to receive the $10,000 award. This year she served as co-president of Latinos in Action at PCHS. Her two sisters attended the luncheon with her as well as PCHS Interim Principal Kathleen Einhorn. 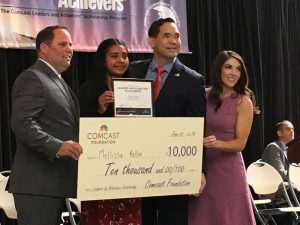 The Comcast Leaders and Achievers Scholarship Program is a nomination-based award, and one student per school is nominated by their principal or guidance counselor. There was not a quorum of board members present at the meeting so consent items could not be approved. The board is holding a Special Regular Session on Thursday, June 22, at 6 p.m. to approve consent items, review policies for posting and approval, and vote on the FY18 Revised Budget and the FY19 Preliminary Budget. School board student representative Steven Mitchell said he plans to poll students this fall on topics the board is discussing so he can accurately reflect student opinions. Communications Director Melinda Colton reported PCSD Chat will be used this summer to keep Summer School parents updated. She said traffic on the district’s social media channels continues to increase and she is posting frequently throughout the summer months. Facebook followers increased by 37 percent last month and page views increased by 49 percent. Colton is participating in a virtual Social Media Camp next week to stay current in the latest education trends around using social media as a key communications tool. Interim Superintendent David Gomez thanked Colton for providing clear communications on some of the sensitive issues that recently occurred. 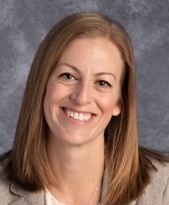 He reported that he talks with incoming Superintendent Jill Gildea weekly and should know her timeline for arriving in Park City in the coming weeks. Superintendent Gomez also reported the district had a large pool of candidates for the new secondary assistant principal positions, which included a 50/50 mix of internal and external candidates. Julia Collins, Senior Transportation Planner for Park City, and Rob Sunderlage, an associate with Horrocks Engineers, reviewed three design options for a proposed pedestrian and bike tunnel planned under SR 248. The proposed tunnel will be in front of Park City High and LDS Seminary. It will replace the existing signalized crosswalk. Collins said the tunnel will provide for a higher level of safety and connectivity for students as well as the community at-large, and will improve the overall delay and vehicle congestion on Kearns Boulevard. She aid the city has conducted a SR2 48 corridor improvement study, gathered community input, collaborated with UDOT, the LDS Seminary, and area residents, completed traffic analysis, and continues ongoing discussions with the school district. Board Vice President JJ Ehlers said she will poll the board this week to determine their preferred option. Ehlers also asked the city to look into the feasibility of adding electric charging stations during the construction process of the tunnel. City officials will meet with the board again in August to request easements and review the memo of understanding. Park City plans to finalize the design this summer, with construction commencing in Spring 2019. –Micaela Carriel, a social studies teacher at Park City High and the women’s soccer coach, expressed appreciation to the board for adding 30 paid days to its maternity leave. She said it makes her feel valued as an educator. She asked the board to review the wording so teachers who are expecting during Summer or Winter Recess can take their maternity leave from their contracted days. –Melissa Perry, a math teacher at Park City High, thanked the board for its consideration of offering 30 paid days to the district’s maternity leave for mothers and fathers. She said it will help reduce the financial burden on teachers. The board will meet Thursday, June 21, to vote on the FY18 Revised Budget, and the FY19 Preliminary Budget. Jim Tedford, a retired teacher and community member, said given the city and county tax increases, he has concerns about the budget and proposed tax increase from the school district. He questioned why the board is hiring three more assistant principals at its secondary schools. He also expressed concern about the salary and benefits the board is paying the new Superintendent. The board continued its discussion of the FY19 budget, including the addition of two special education teachers for elementary schools, one additional transition teacher for post high schools students with mild/moderate disabilities, the cost of the classified job study recommendations, and the elimination of some student fees. Two Additional Special Education Teachers: Interim Principal David Gomez shared data that illustrates significant gains academically when there are additional specialized personnel helping special education students. Special education teachers also require additional time for professional development for better alignment with general ed teachers and interventionists. The teachers current caseloads do not allow them to provide the kind of one-on-one instruction they would like to give to their students. Additionally, a new law requires more accountability from school districts to show that special education students are making progress. One Additional Transition Teacher: The board agreed to not fund the transition teacher position for post high school in this budget but will use the coming year to find out the needs of students and parents for such a program. Classified Job Study: Business Administrator Todd Hauber said 29 employees are impacted by the district’s recent review and salary study of classified positions. Elimination of Academic Student Fees: The board affirms that a public education should be free to the patrons of the school district and that barriers to public education should be removed wherever possible. In that effort, the school board has waived the fee requirements for mandatory and academic fees for the 2018-19 school year. Hauber presented the board with a list of discontinued academic students fees in the amount of $691,900. The board’s action is not a categorical waiver of all fees. Fees subject to this action include fees for elective courses and general education expenses. This action does not extend, at this time, to extracurricular fees and other fees for activities conducted outside the normal hours of the school day. In all cases, remaining school fees are subject to State law and district waiver policy. Hauber recommended the rental of musical instruments remain with the families this coming school year while the district spends the year learning more about how best to manage instruments at its secondary schools. Board member Petra Butler recommended increase the board’s compensation by $7,000. She said the board does a tremendous amount of work and said the additional compensation will attract more people to run for the board. Board President Andrew Caplan said a study was completed a few years ago on board compensation. The board will review the study. Interim Superintendent Gomez said the fencing materials have been ordered and work will begin on Monday. Work will also begin Monday on the elementary schools’ entryways and the additional items that have been added to the architectural plans. A districtwide visitor management system has been purchased and will be tested in the district’s summer school programs over the next few months. He said he is keeping the new superintendent, Dr. Jill Gildea, updated on the safety projects underway and they will be creating contingency plans, in the event that a project is not complete before school starts this fall. There’s more to summer than video games or sheer boredom. With more than 100 class offerings, students can experience a fun and educational summer thanks to the district’s Community Education program. For preschool-aged children, there are offerings such as Animal Safari, Art, Diggin’ Dinosaurs Jr., Kids Yoga, and Bubbles & Water Science Fun. For elementary students there is Beginning Chess, Drawing & Painting, Cartoonpalooza, Movie Star Camp, Cooking, Science, Digital Moviemaking, Lego Robotics, and much more. Some classes begin next week. 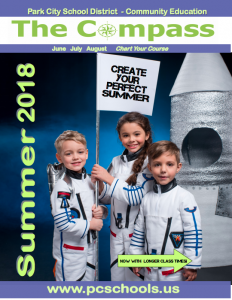 For a complete listing of summer offerings, view The Compass here. Click here to register online or call Jane Toly at 435-615-0215. Summer is a great break from school but not a great break from learning. That’s why Park City School District is excited to offer Summer School again this year for students in grades 1-8, starting June 18. Online registration is now open. This is the first summer the district is offer sessions for students going in to grades 7 and 8. Secondary Summer School will be based on project learning with field trips to the Egyptian Theater, and enjoying activities such as yoga, hiking, paddle boarding, street art, break dancing, and art. Students will also take part in service projects. 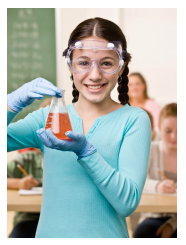 The secondary Summer School, held at Treasure Mountain Junior High, runs June 18-July 12, Monday through Thursday. The elementary Summer School, held at McPolin Elementary, runs June 18-July 26, Monday through Thursday. Cost is $100 and includes breakfast and lunch.